The combination of melting snow and heavy rain has caused ponding on some local roadways in some areas Wednesday. Traffic delays due could be moderate during the evening rush, but should lessen by about 7 p.m. Wednesday, said Storm Team4. 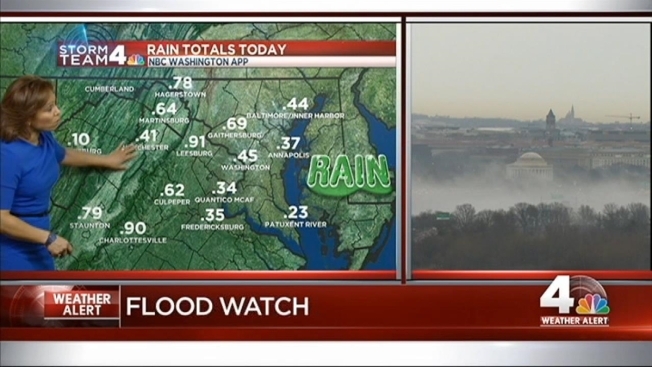 Moderate-to-heavy rain and fog are moving through the D.C. area, leading to poor visibility in some spots. Flood warnings are in effect for some creeks, streams and parts of the Potomac River in Maryland and Virginia. In Purcellville, Virginia, Appalachian Trail Road was flooded late Wednesday afternoon, and in Laurel, authorities said they plan to close the American Legion Commuter lot at 8 p.m. Wednesday because it has the potential to flood. The National Weather Service said some areas to watch out for are Westminster near Thurmont, Emmittsburg, Uniontown and Frederick County, Maryland, and Middleburg, Virginia. Up to an inch of rain is possible before the rain ends. The District had gotten nearly half an inch of rain by late Wednesday afternoon, with .91 inch in Leesburg and .69 inch in Gaithersburg. Rain was falling at a rate of close to a quarter-inch per hour as of 4:30 p.m. around Calvert Beach and Leonardtown. That rainfall rate will later move up toward Quantico and Culpeper. Wednesday has been unseasonably warm, around 50 degrees, leading to quicker melting of snow leftover from January's blizzard. The record high for Feb. 3 is 65, according to Storm Team4. Swift water rescuers at the Great Falls Fire Station in Fairfax County, Virginia prepared for flooding Tuesday, checking equipment, running engines on the boats and driving around low lying roadways looking for trouble spots. "Most likely we're going to be getting some flooding with the amount of snow we got the days before, and with the rain we're going to be getting and the temperatures, it's going to melt and there is no place to go, so water's going to rise," said Romulo Maciel of Fairfax County Fire and Rescue. 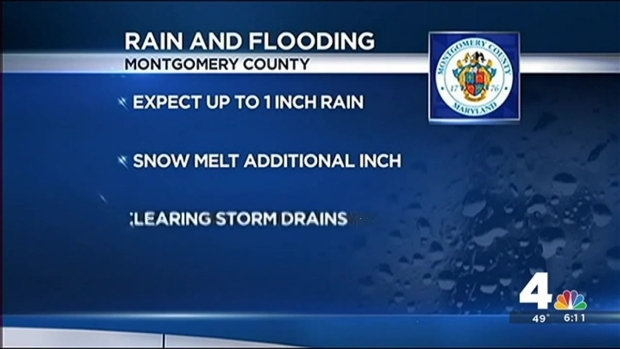 News 4's Chris Gordon looks at preparations for possible flooding Wednesday triggered by heavy rain and melting snow. Montgomery County, Maryland, was monitoring weather forecasts. In addition to an inch of rain, the melting snow may result in another inch. Highway crews were clearing the 60,000 storm drain inlets along roadways Tuesday. In Old Town Alexandria, the waterfront may be one of the first places to flood. Carluccio's Italian Restaurant and Market built its main floor three step higher than the street to avoid rising waters. If there is flooding Wednesday, they are prepared. "We have these really nifty sandbags that deflate when they dry and re-inflate as soon as they get wet," General Manager Sara Haven said. In April 2011, rising water filled Tony and Joe's seafood restaurant at Washington Harbour in Georgetown with 10 feet of water. The damage was devastating. Tuesday they positioned all outdoor furniture within the perimeter of the flood wall that can surround Washington Harbour. The restaurant is waiting for the property manager's decision whether the flood walls will be pulled up for protection.